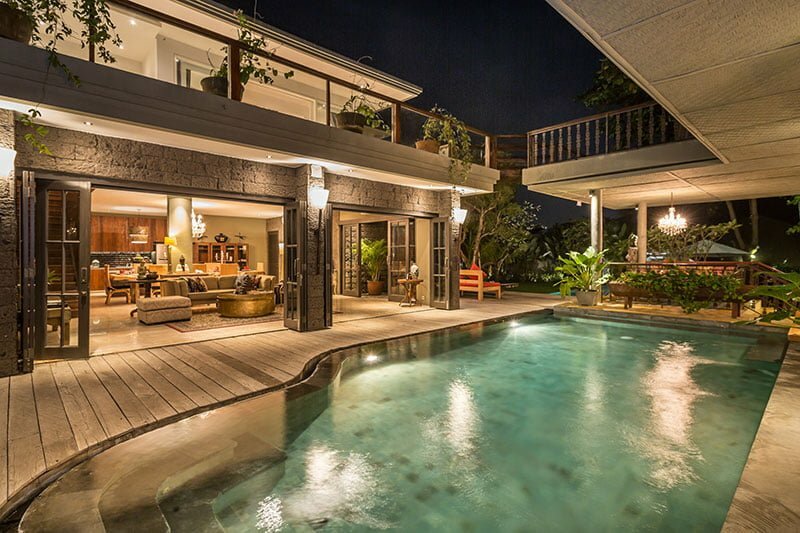 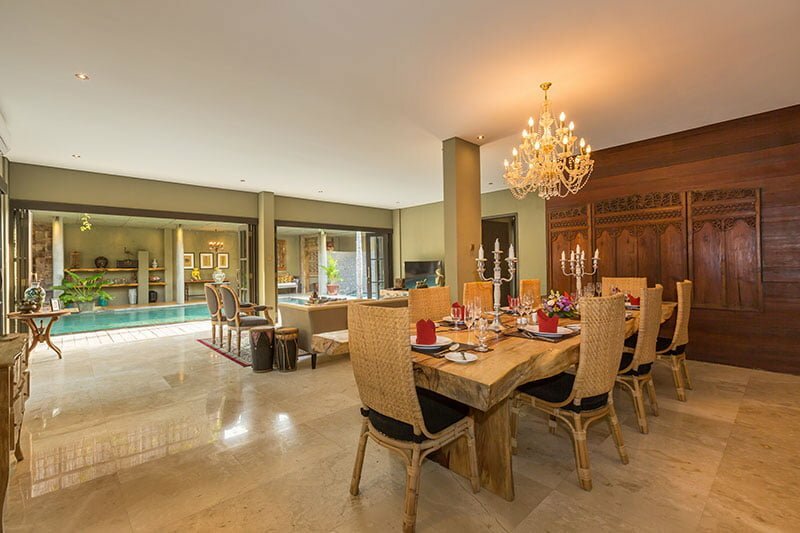 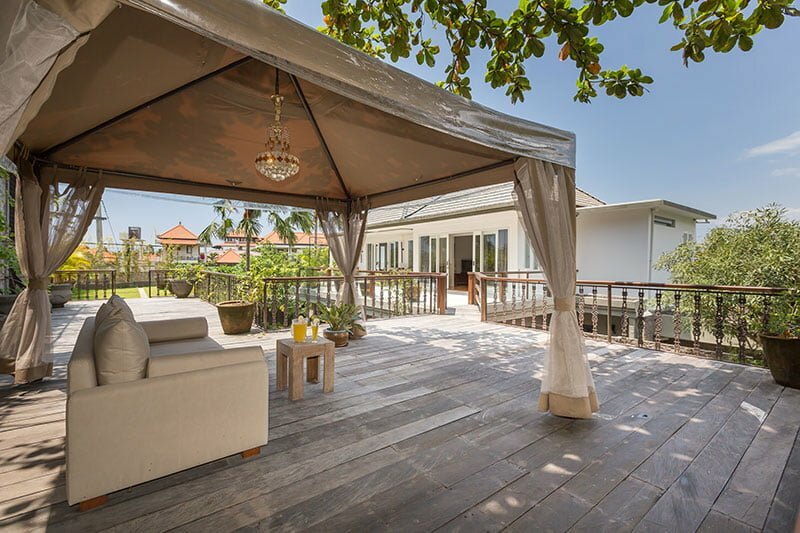 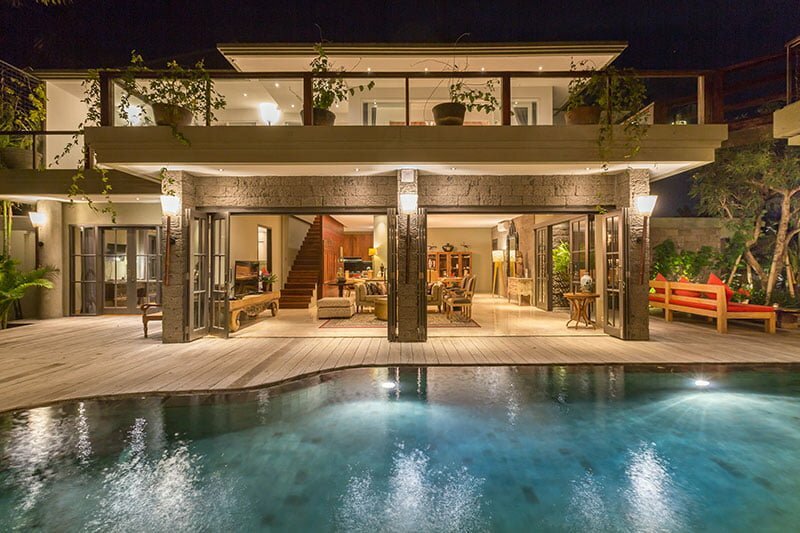 If you are looking for a stunning accommodation base to relax, rejuvenate, and chill-out in style with your family and friends, then our villa, the Villa Jadine, has you covered. 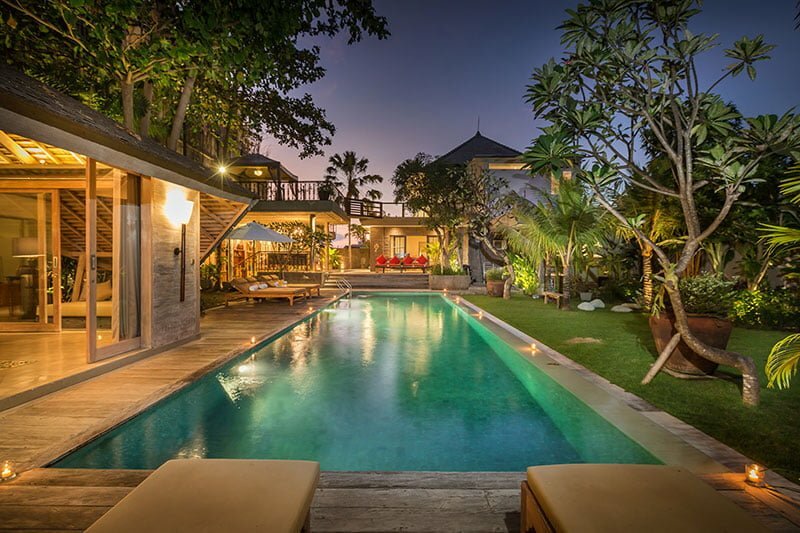 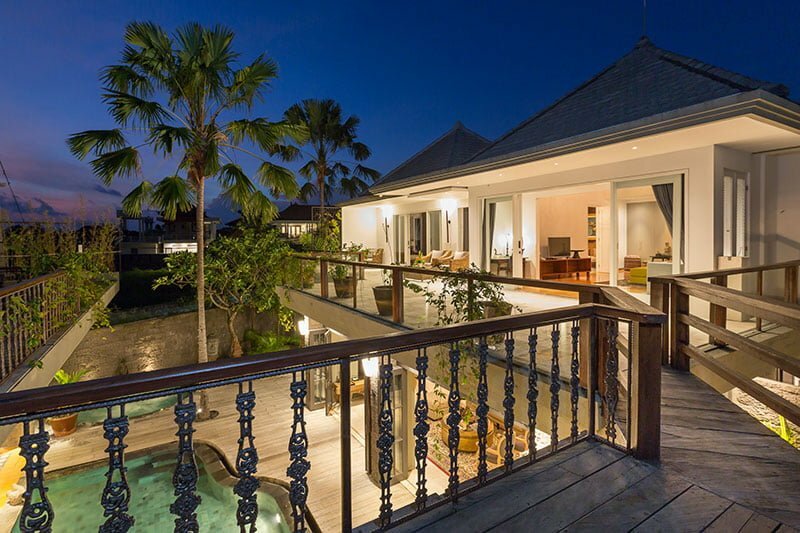 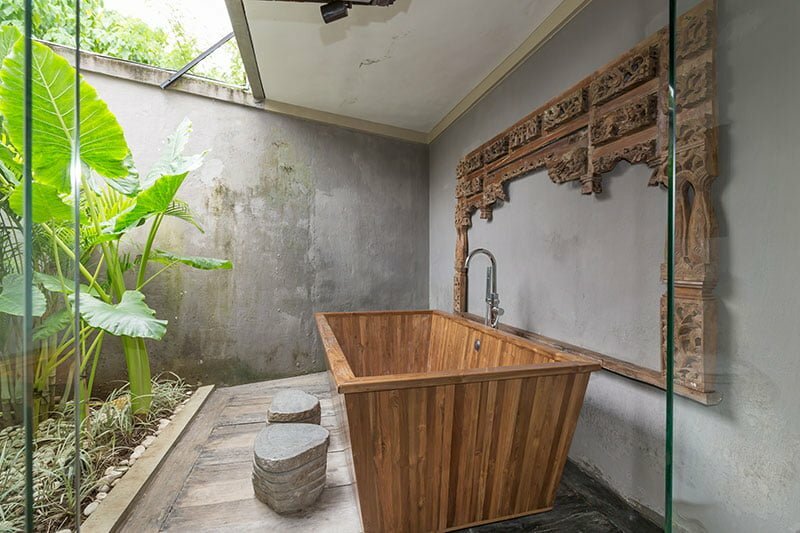 We are based in Canggu, about 30 minutes by car from Ngurah Rai International Airport. 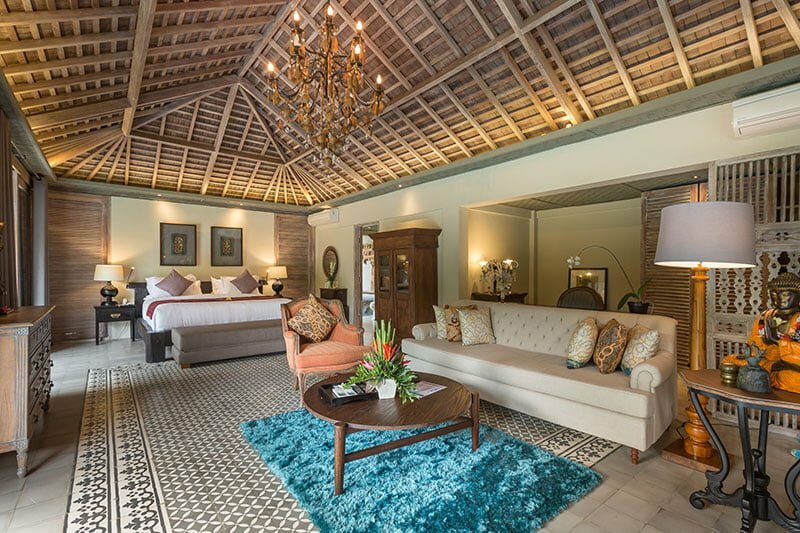 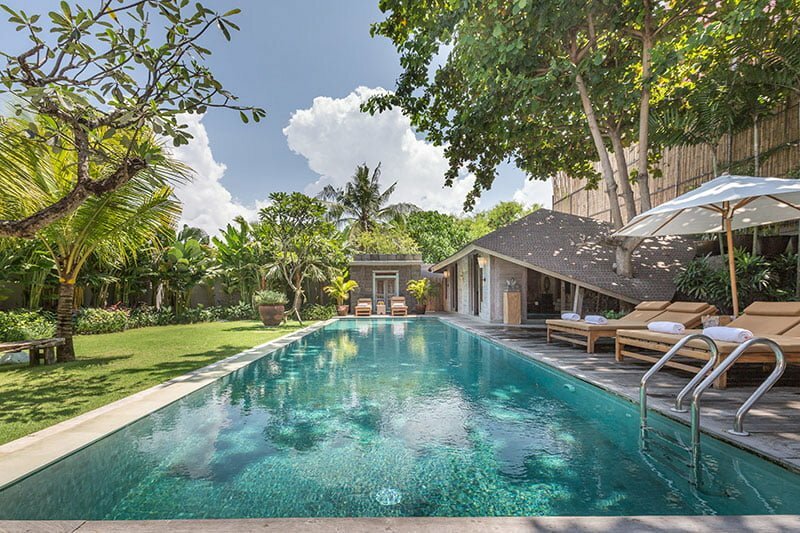 Our villa boasts of offering a luxury vintage giving guests a chance to experience the feel of completely at peace in spirit, body, and mind. 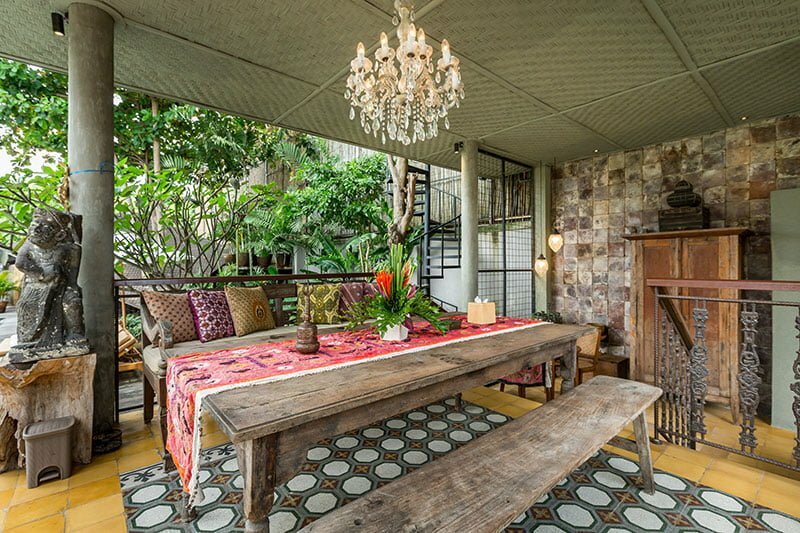 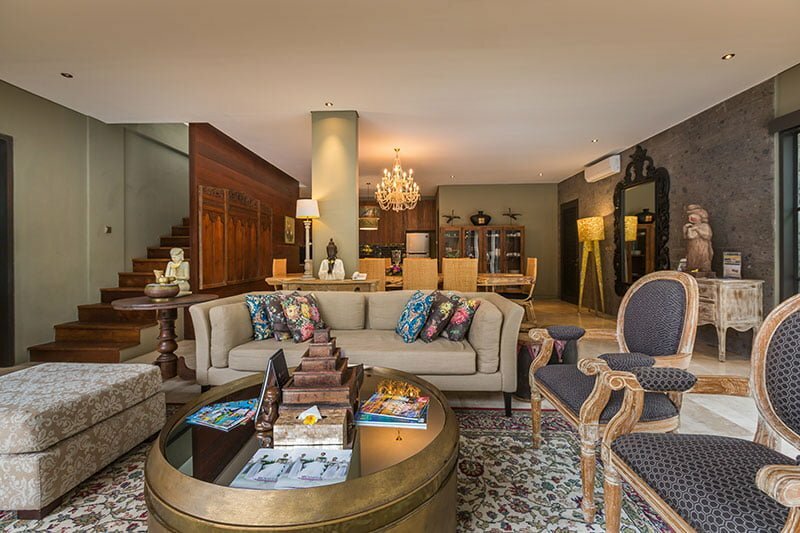 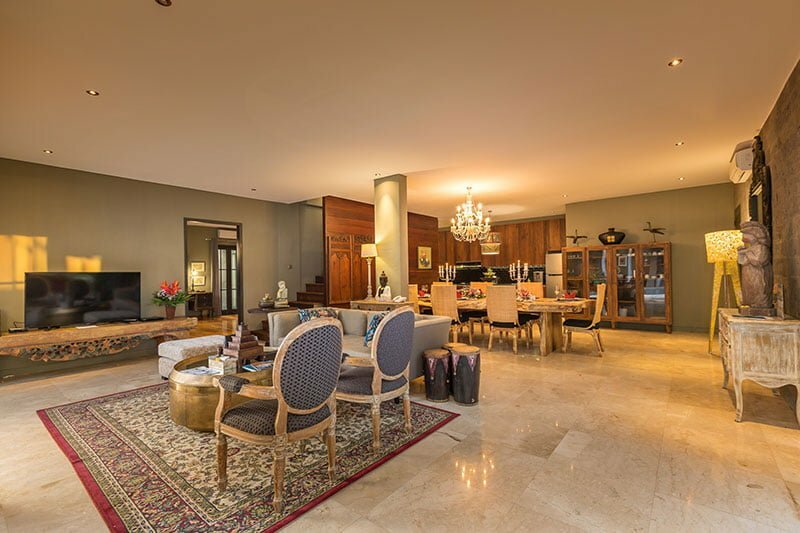 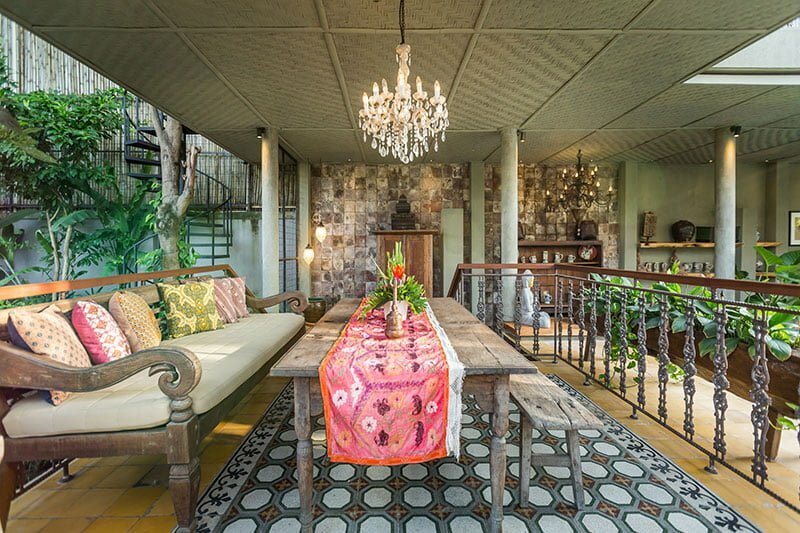 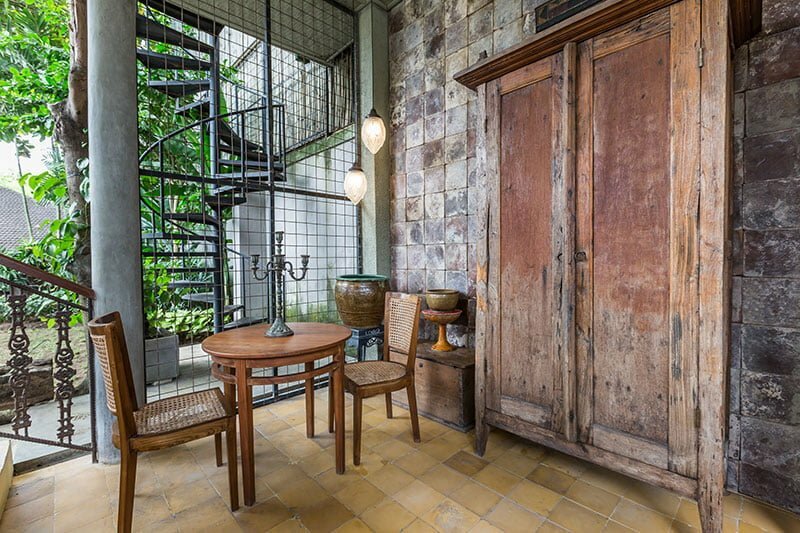 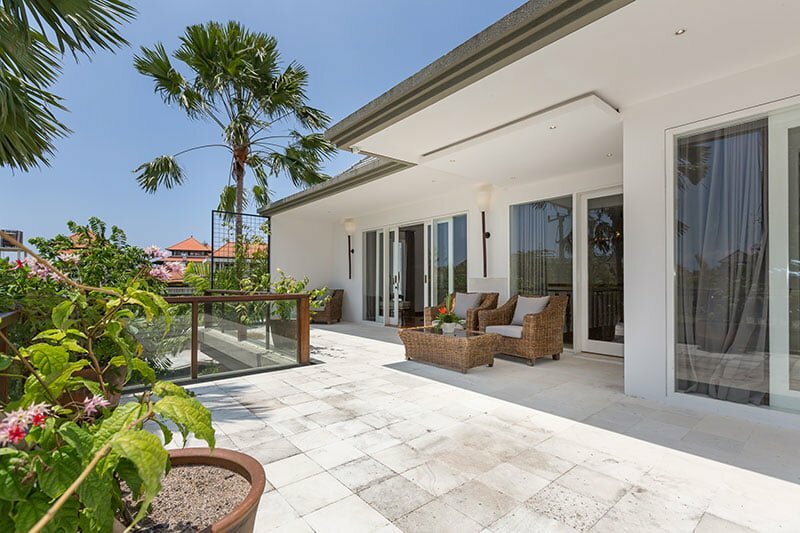 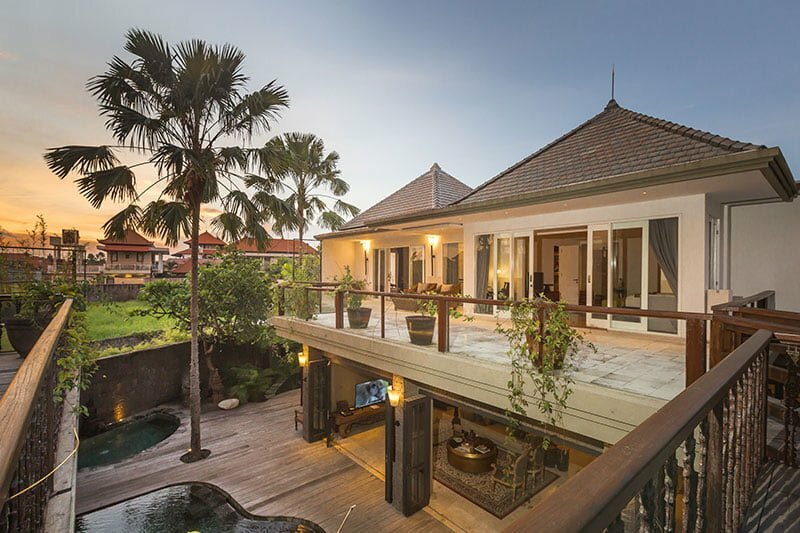 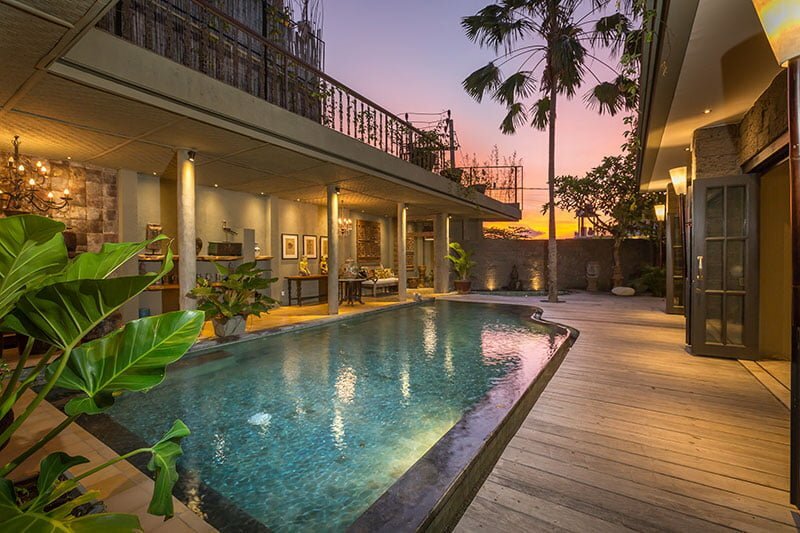 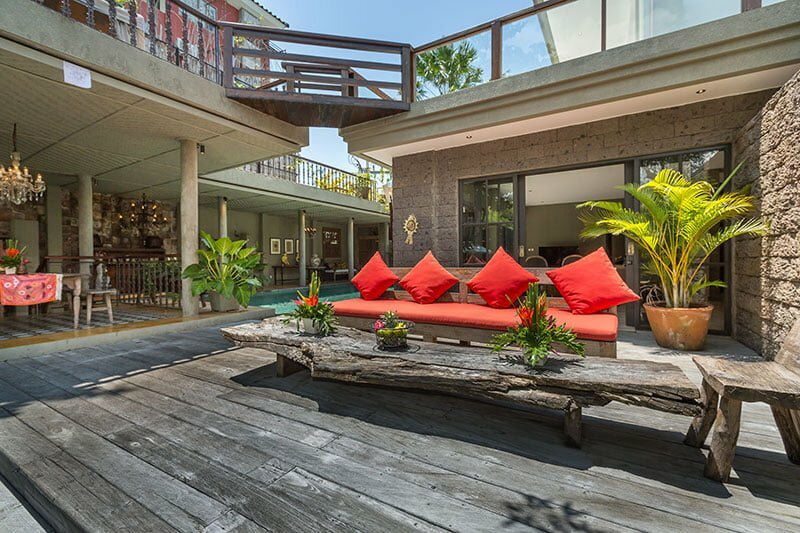 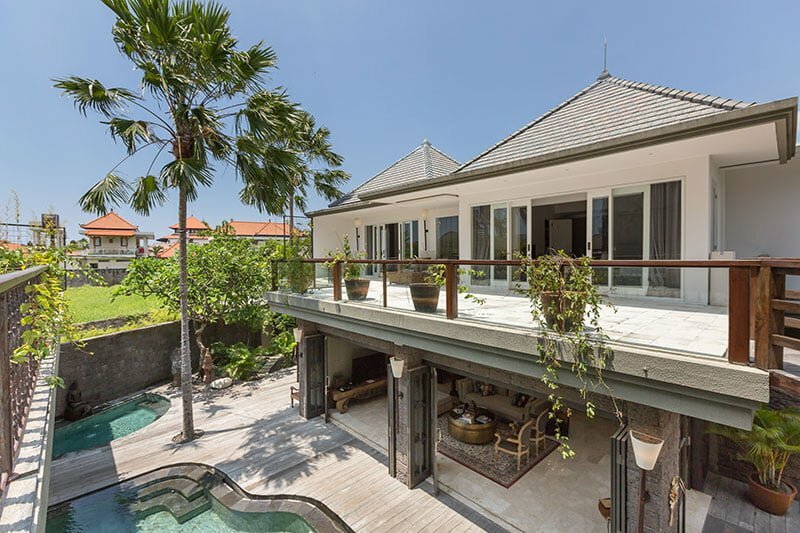 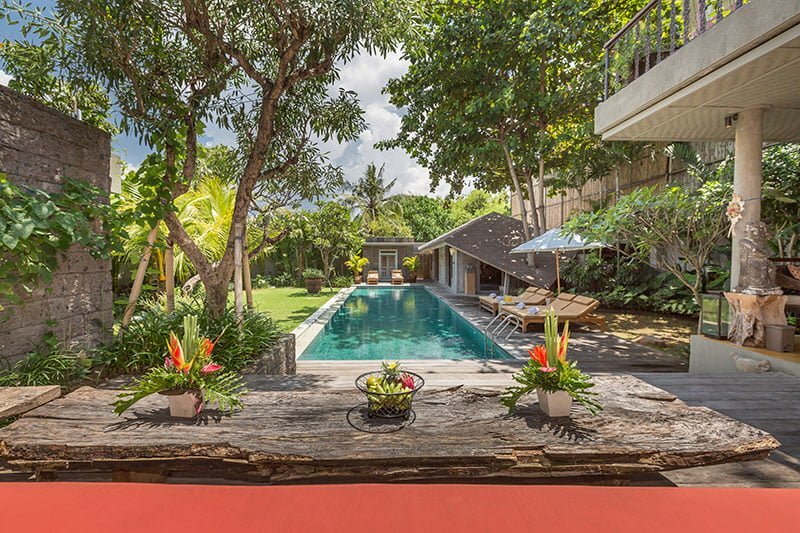 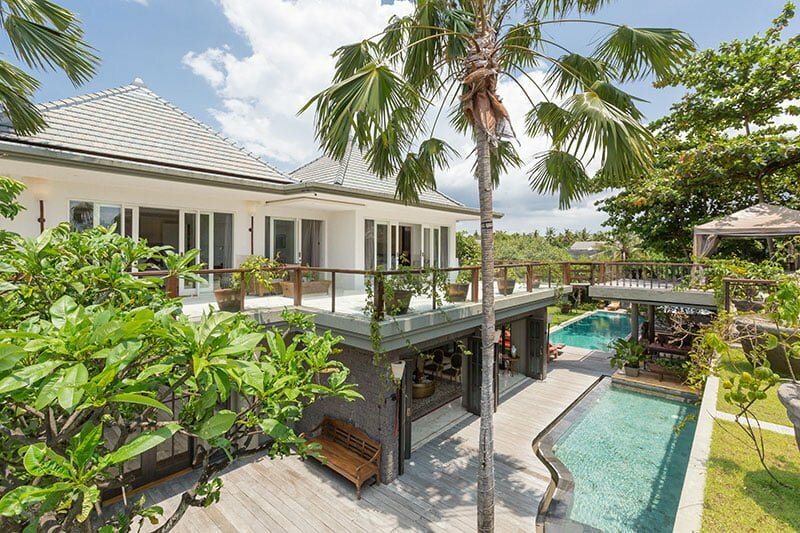 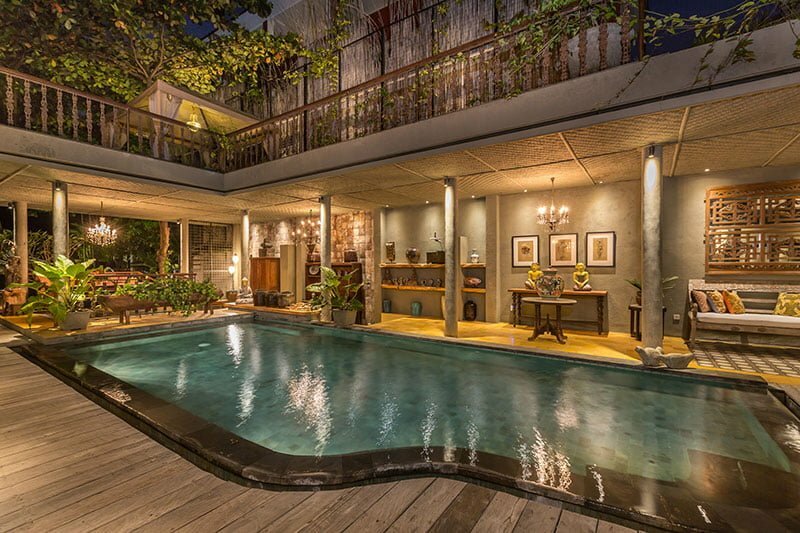 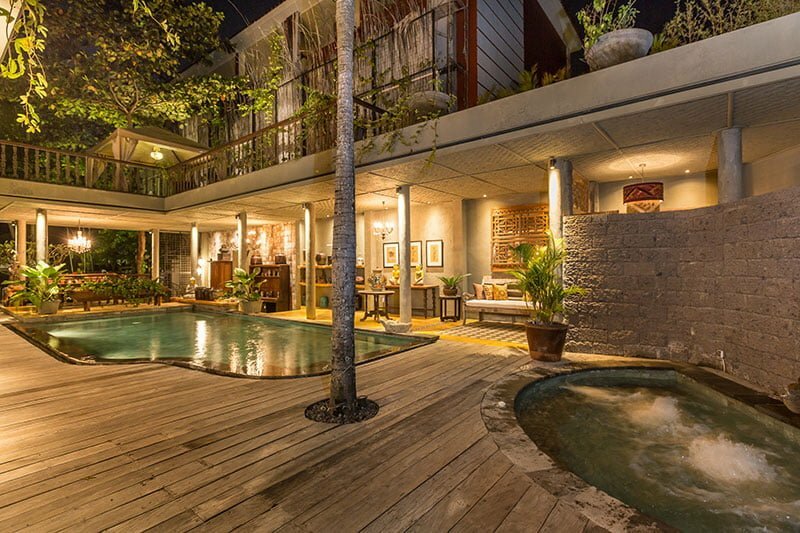 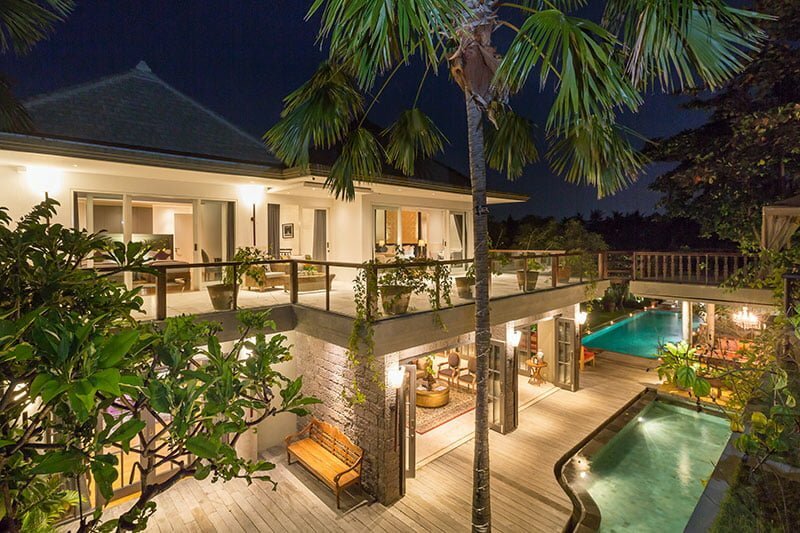 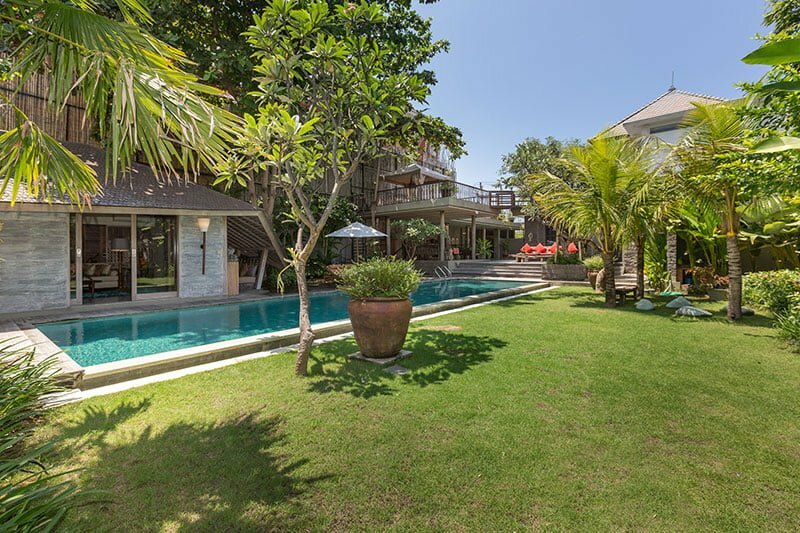 The stunning property is huge and flanked by a lush tropical garden. 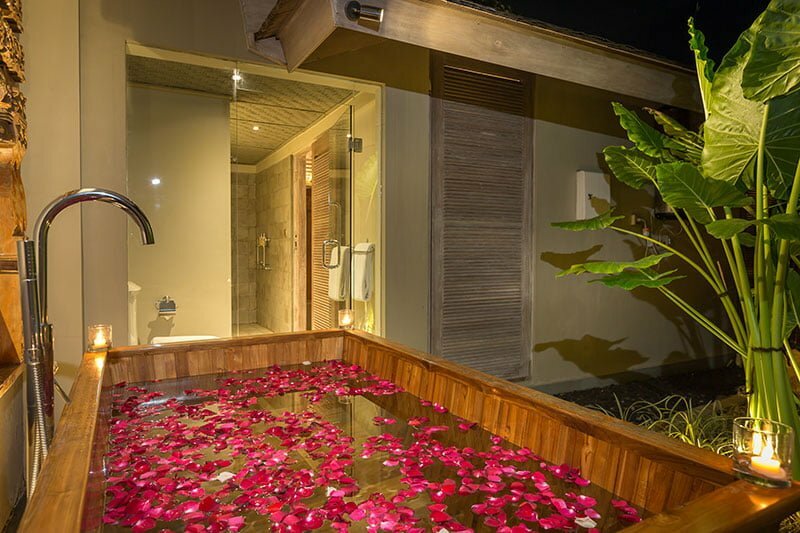 There banquet of beautiful flowers across the garden. 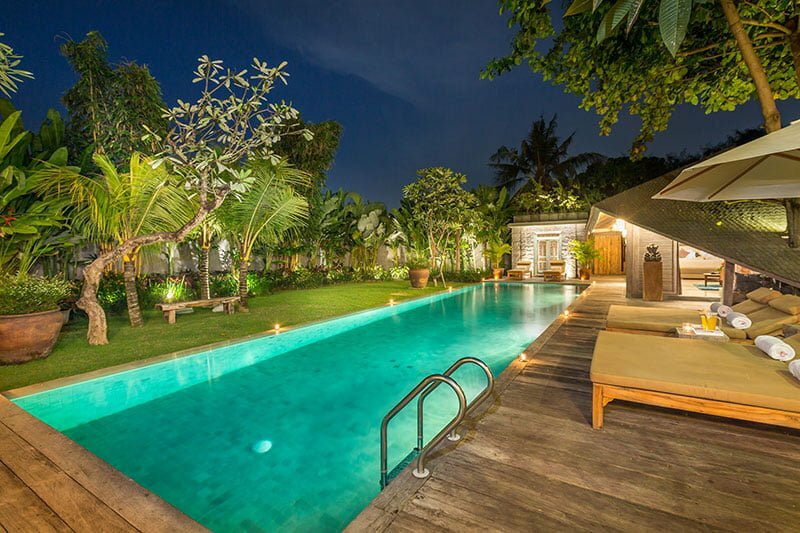 A few meters from the main building sits not one, but two swimming pools (one for kids and the other for adults) and one Jacuzzi. 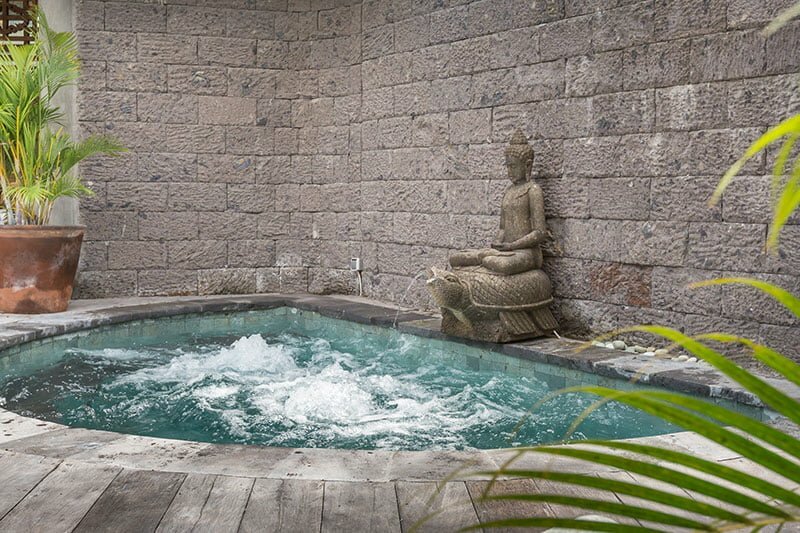 You really know what this means when it comes to relaxing! 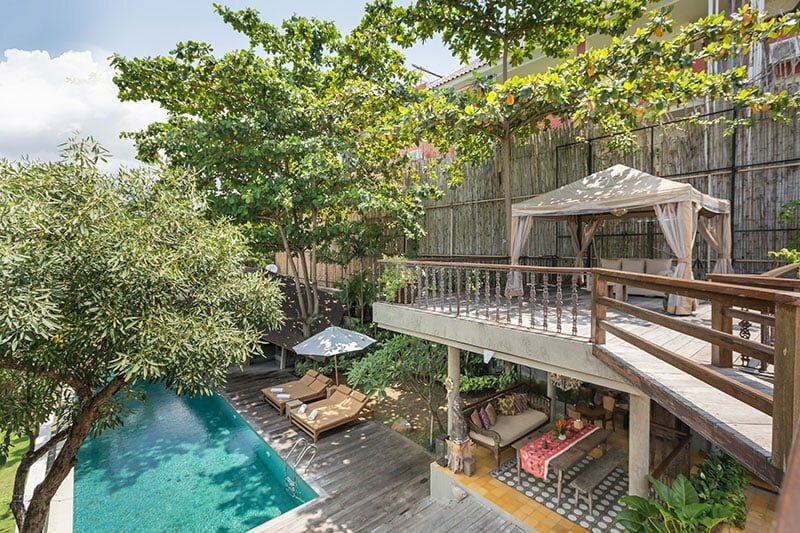 There is also a cozy terrace located a few meters from the pool where guests can have a drink or dinner with family and friends. 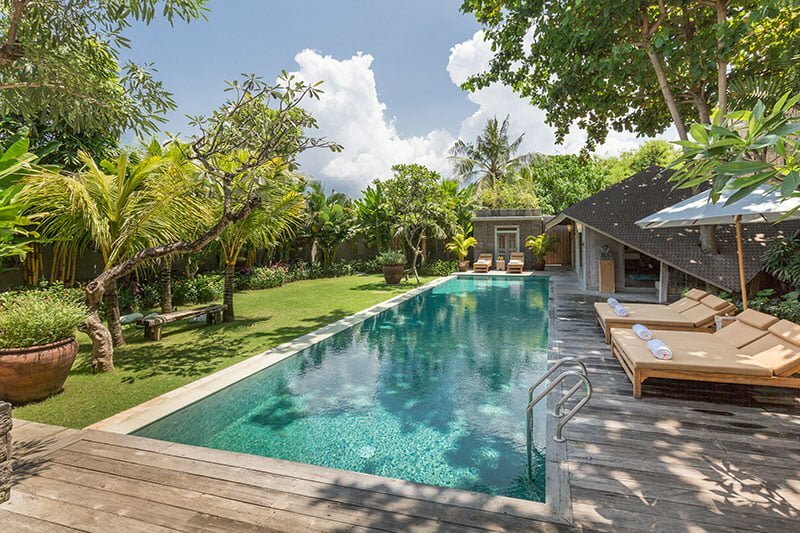 Alongside the pool are several comfy sunbeds for sunbathing and massage sessions. 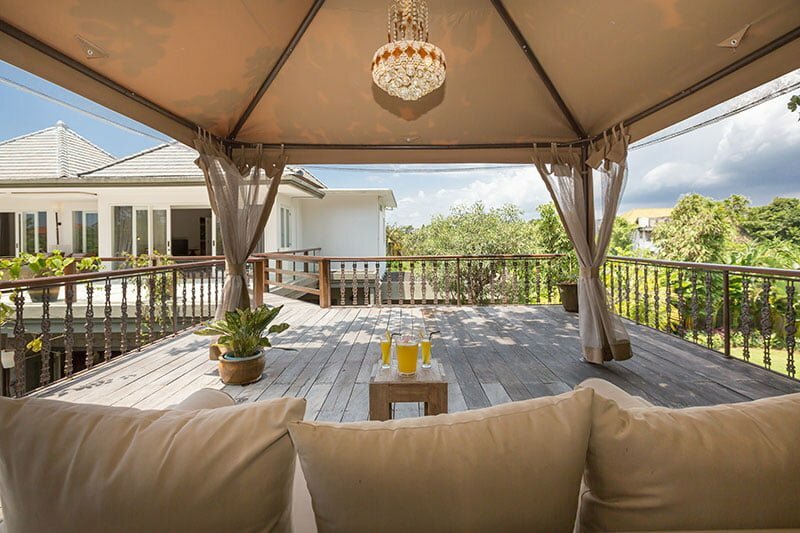 There is no doubt that the outdoor area did impress you, but let us assure that your first impression will double upon landing your feet at our living areas. 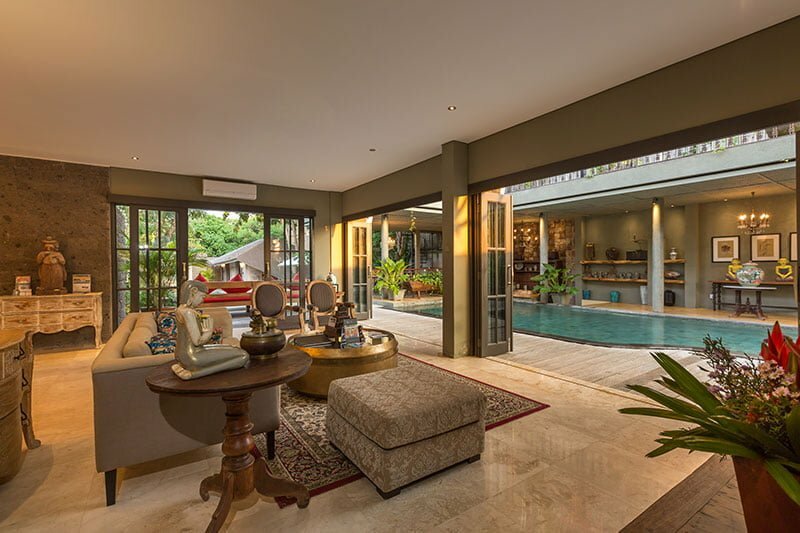 Our villa wants to ensure that the guest’s privacy is on par, and so the unit building has a great living room overviewing the swimming pool. 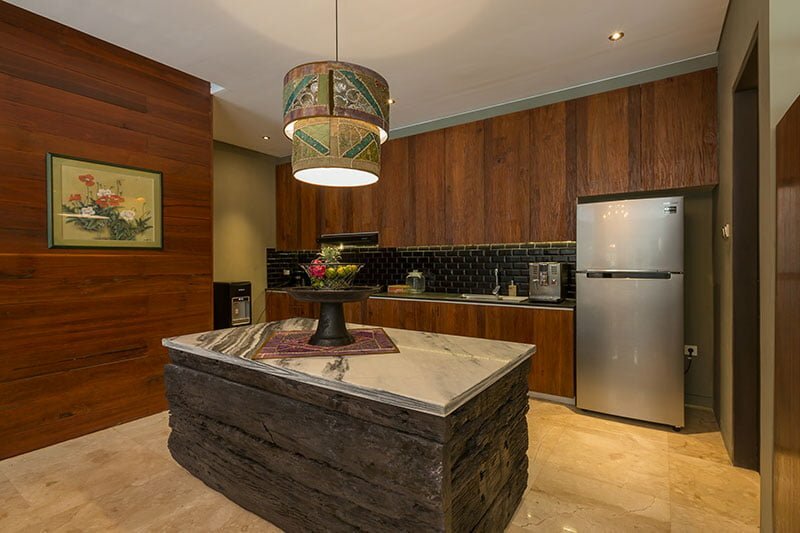 Decors at this area are sleek and cozy facing a flat-screen mounted television. 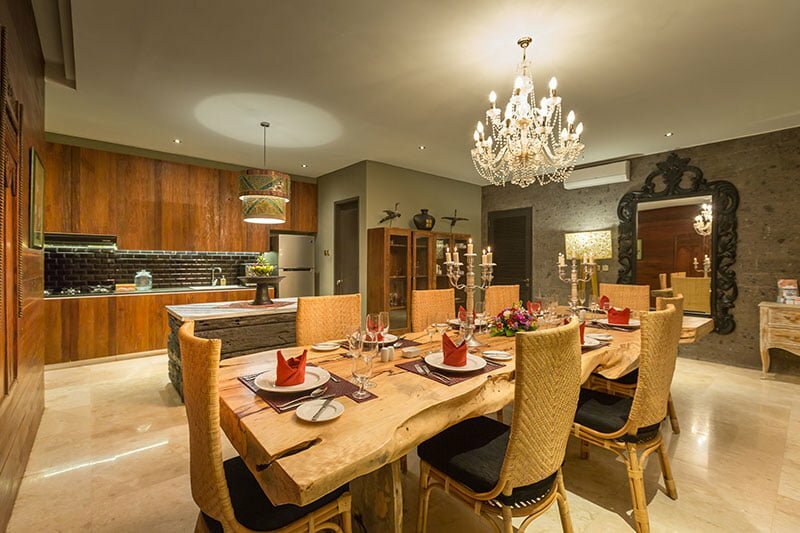 The air-conditioned room with a free Wi-Fi internet has a dining area with a 6-seater dining table surrounded by rattan chairs. 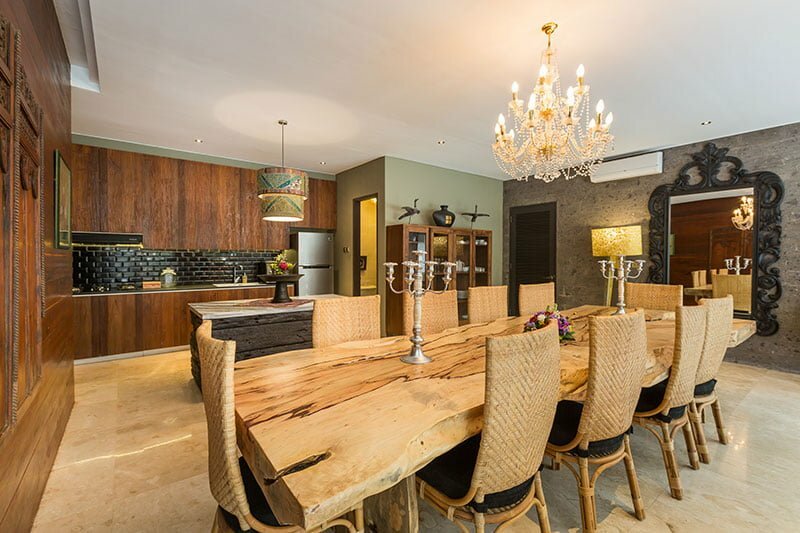 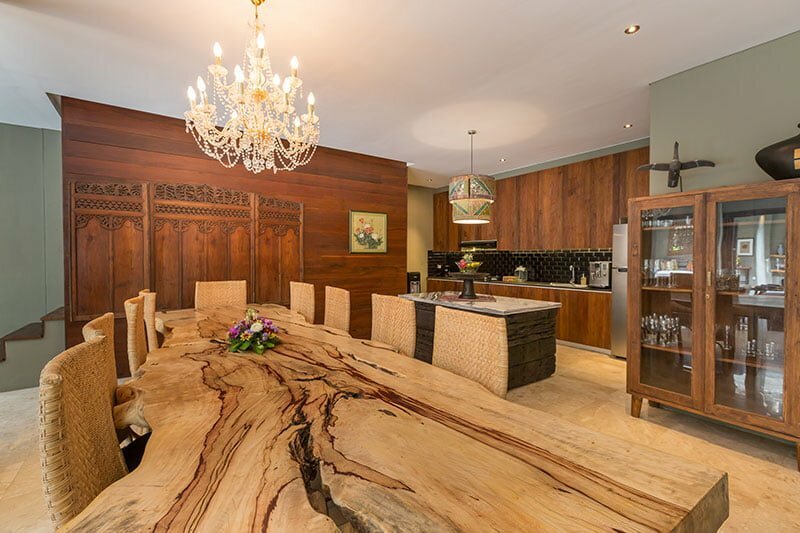 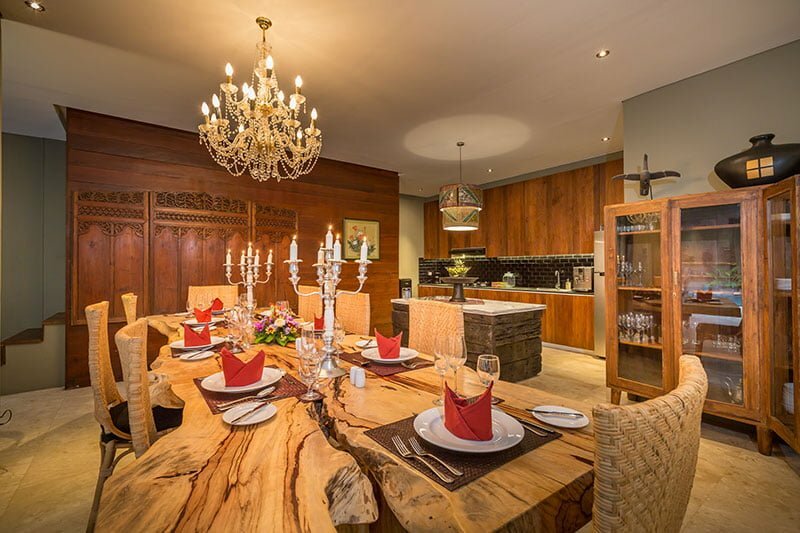 The kitchen is adjacent to the dining area and it features modern amenities for a complete luxury accommodation. 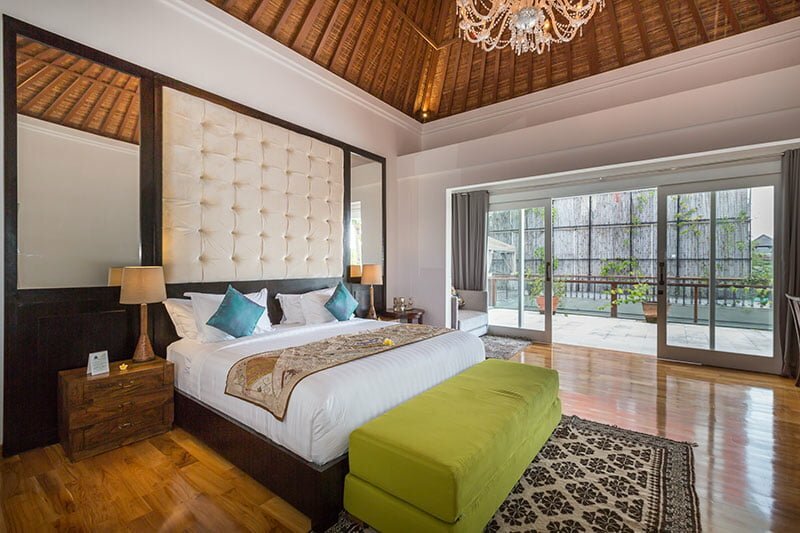 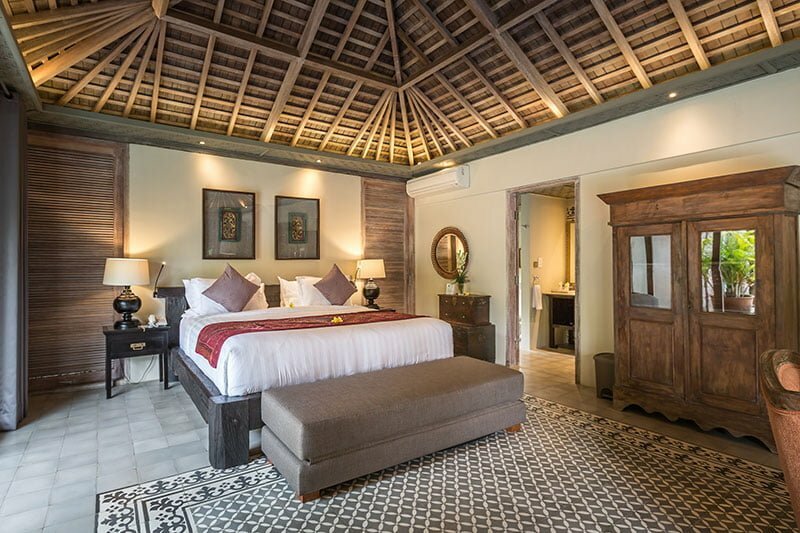 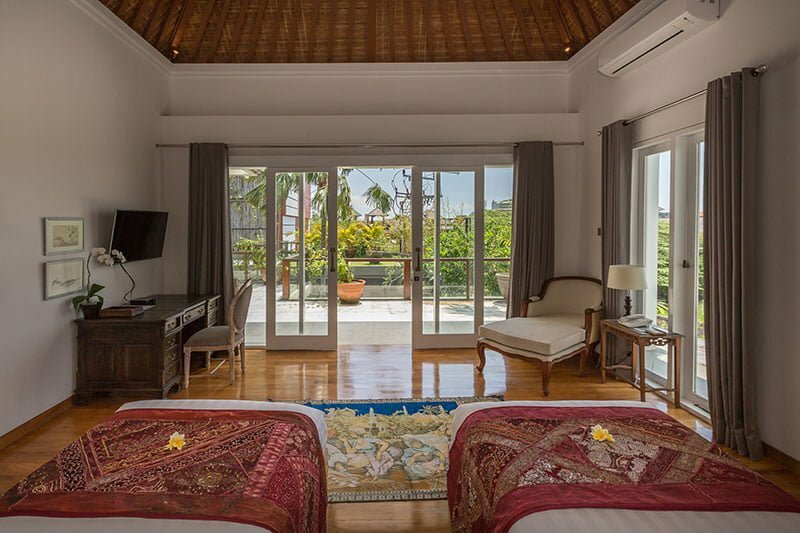 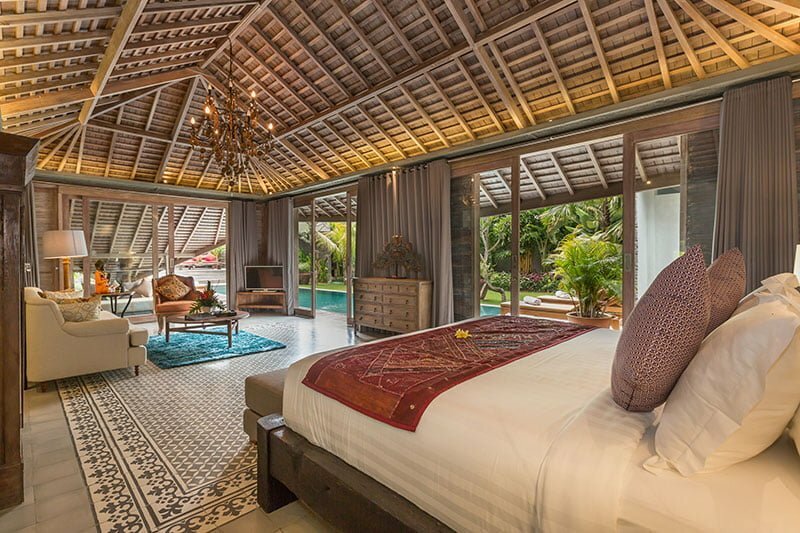 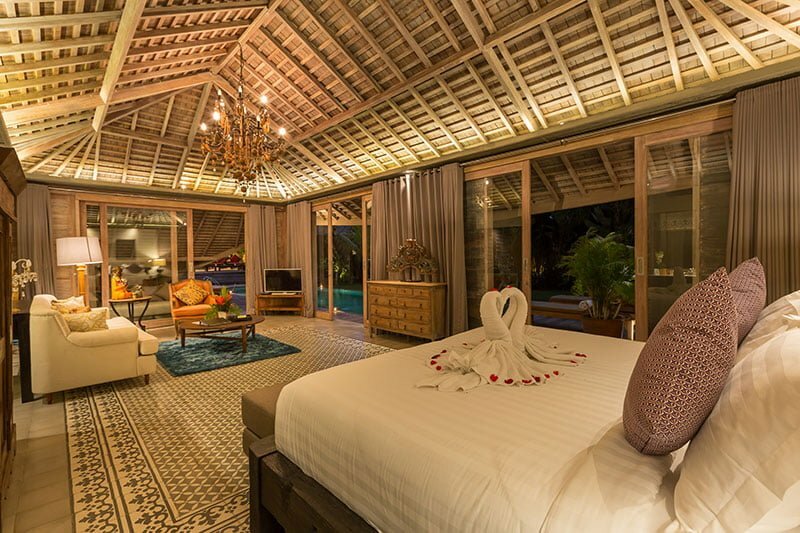 Our villa has three air-conditioned bedrooms, one located on the first floor while the rest are situated upstairs. 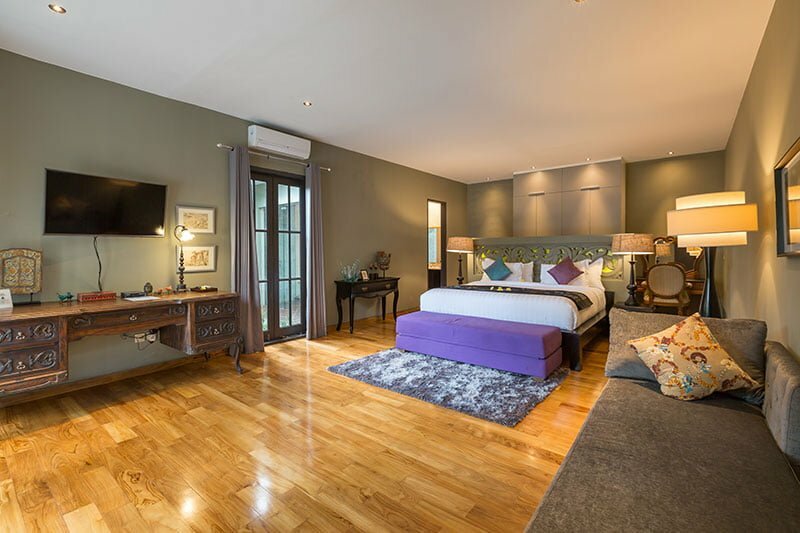 All of them are bright, spacious, and feature modern amenities and facilities like flat-screen television, king-size beds (but one room has twin beds), and deposit safe box. 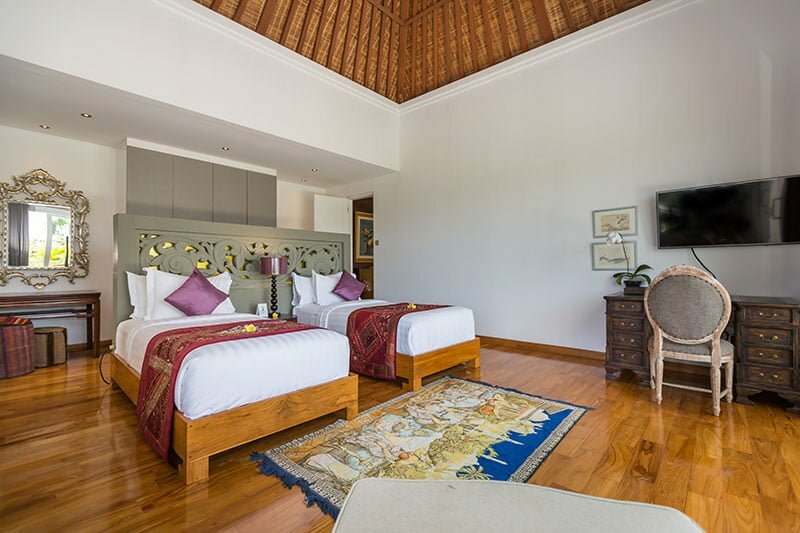 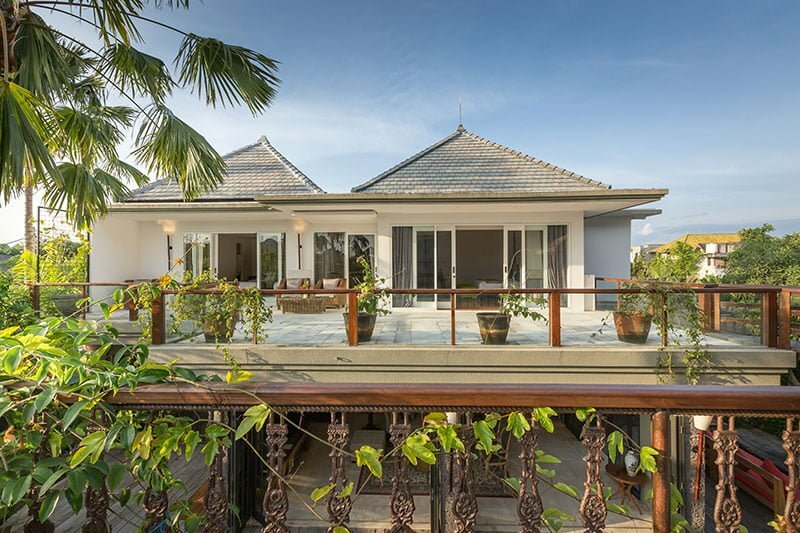 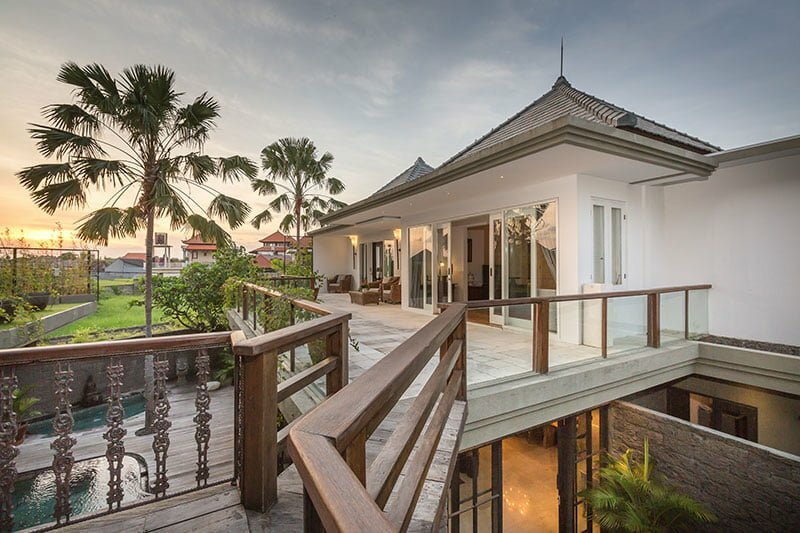 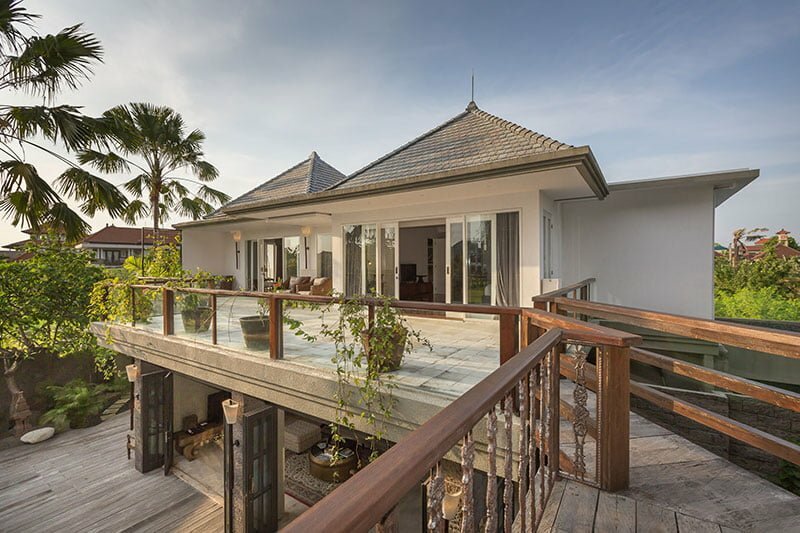 The two upstairs bedrooms have a stunning terrace where guests can enjoy a remarkable view of the rice fields surrounding the villa. 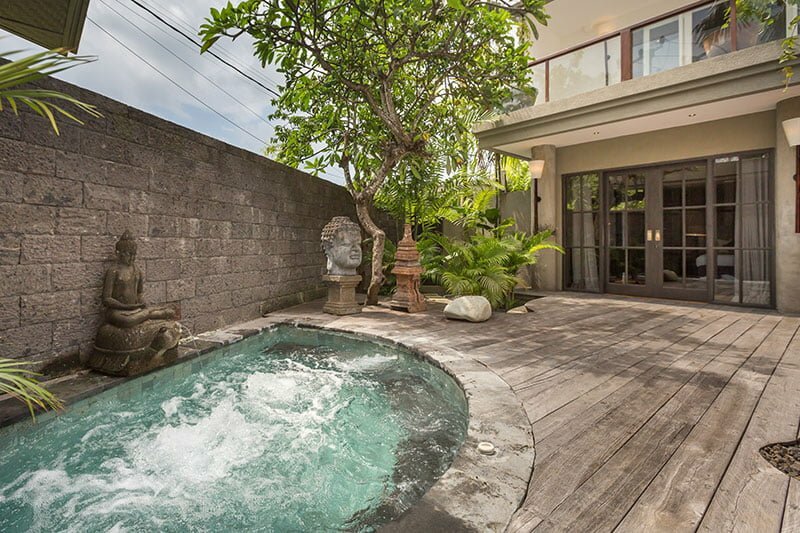 This spot is also great for getting Balinese massages. 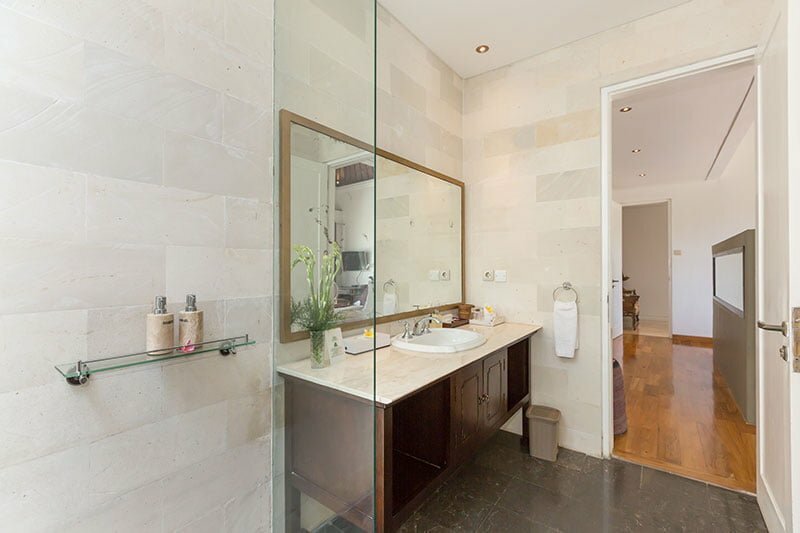 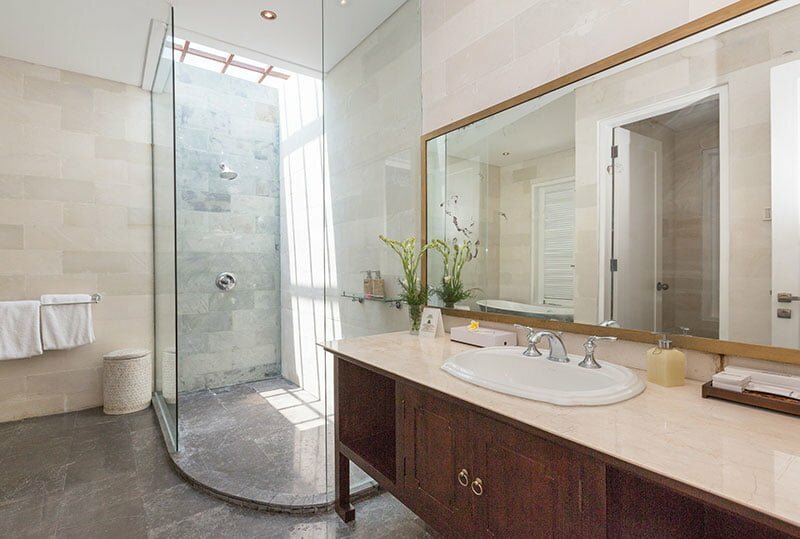 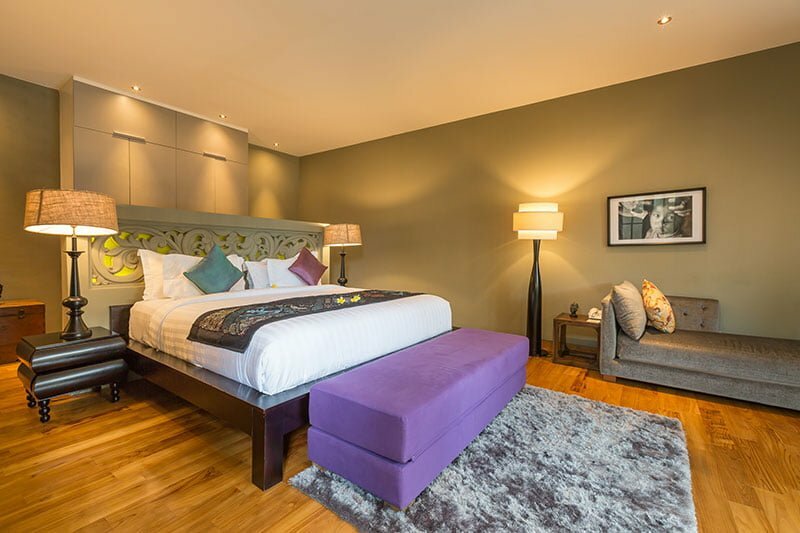 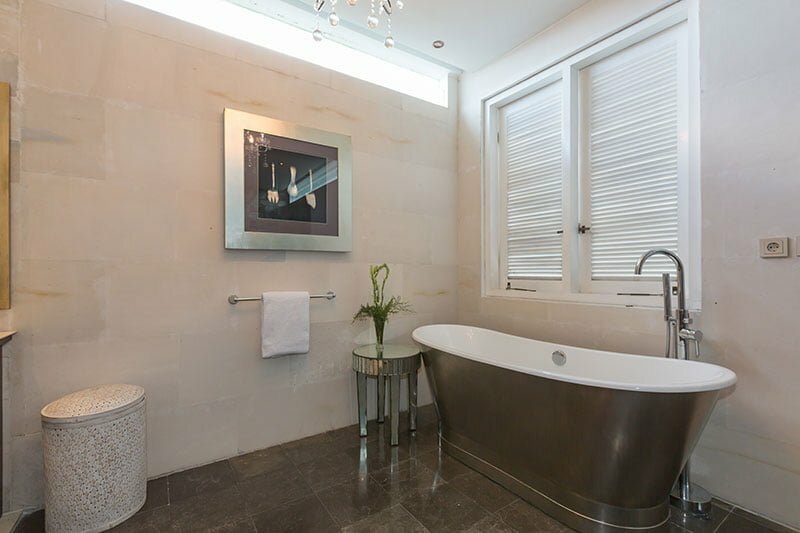 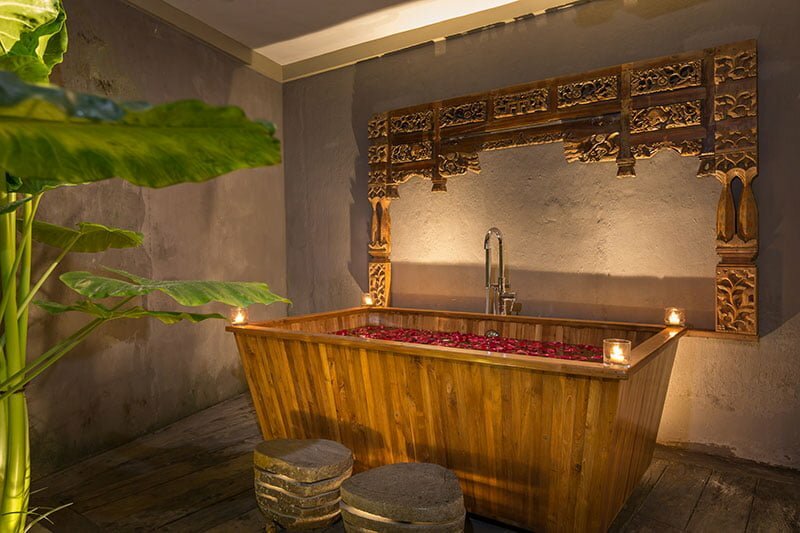 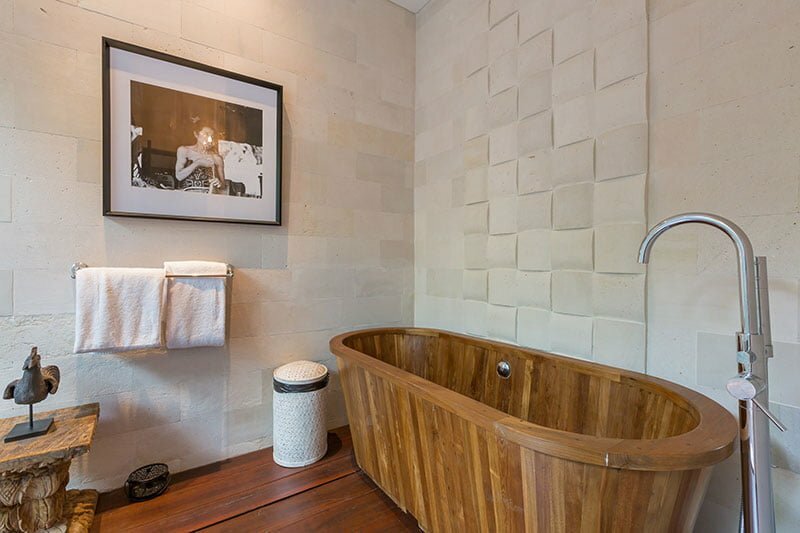 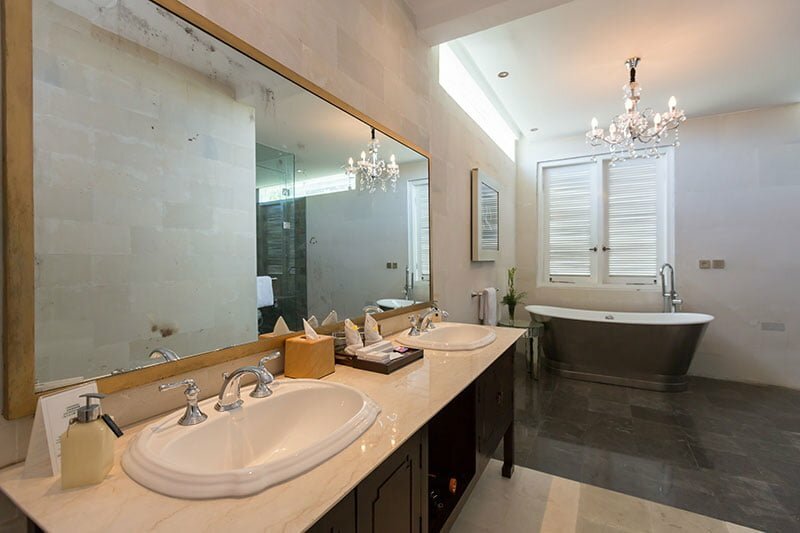 All the bedrooms, nonetheless, are fitted with modern en-suite bathrooms featuring wooden bathtub showers. 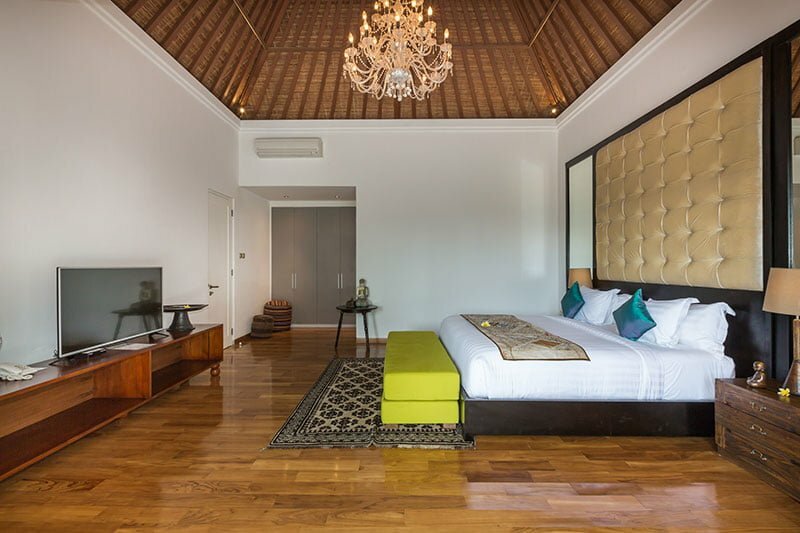 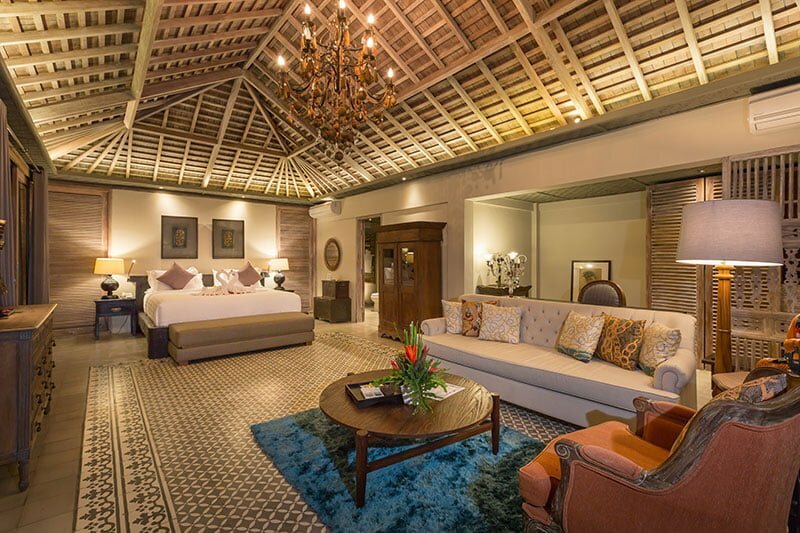 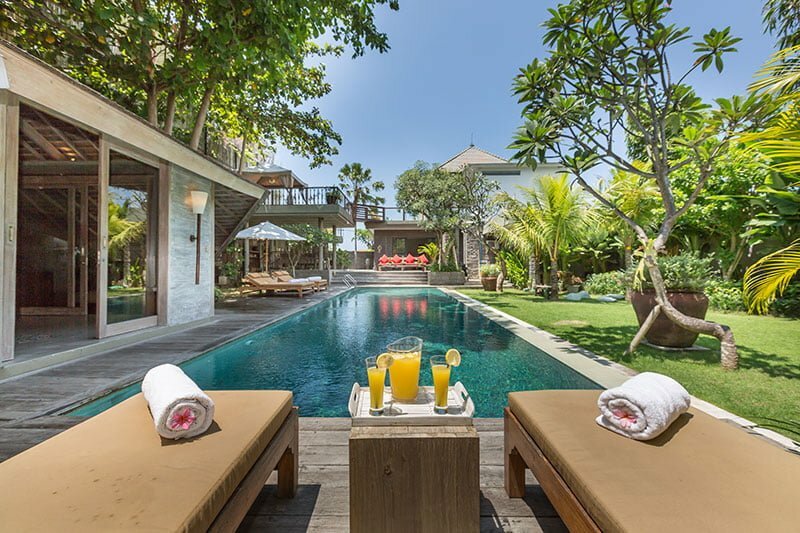 Our villa is one of the few accommodation facilities boasting of unprecedented staffs who know exactly what it means by having a luxury accommodation. 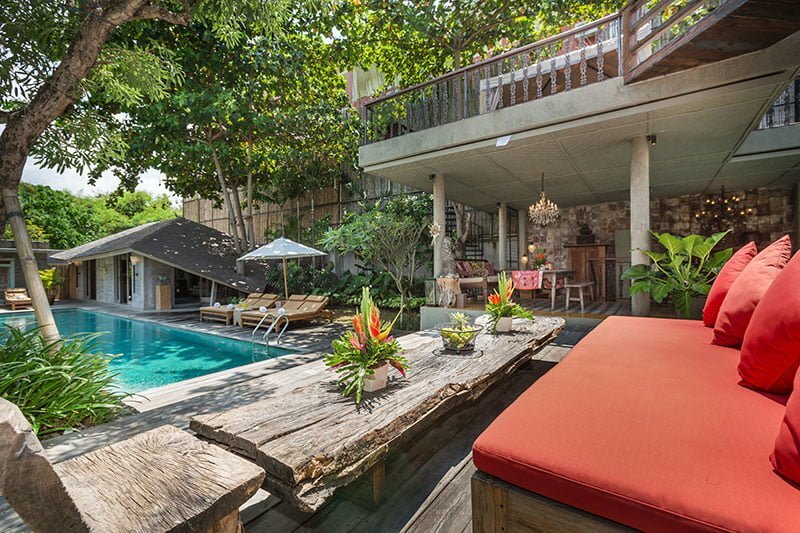 Our team includes the villa manager, pool attendant, housekeeper, massage specialist, and private chef. 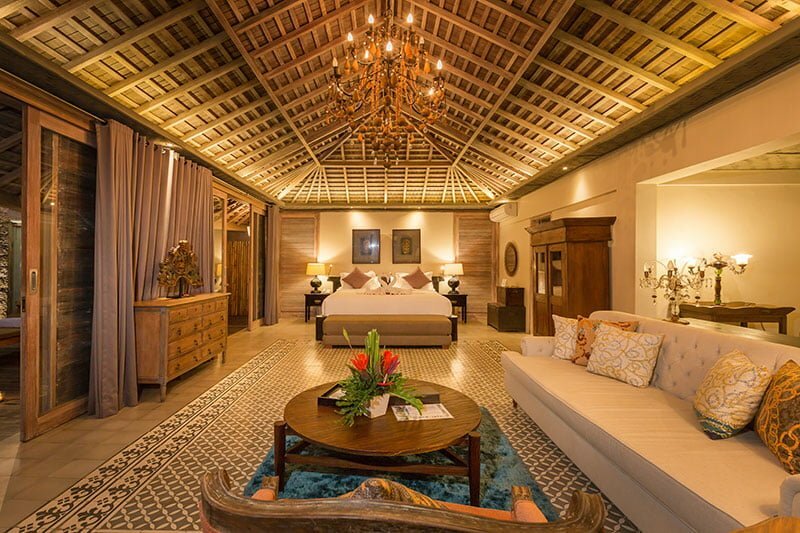 Some of the services we mesmerize our guests with include 24/7 security service, daily staff service, spa & massages, outside catering service, cooking services (lunch and dinner), and tour assistance among others. 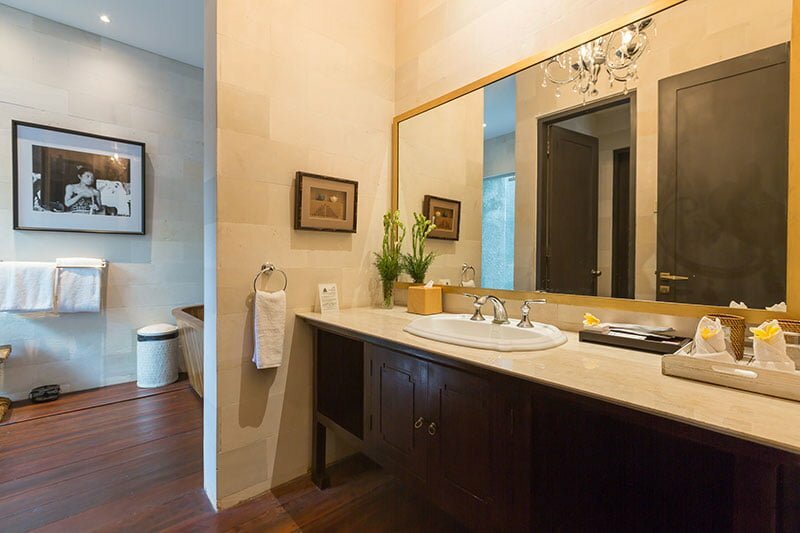 Other services not mentioned are also provided upon request.